OMAHA, Neb. – SpartanNash recently presented $1,000 and $500 grants to Boys Town and Habitat for Humanity of Omaha. The donations were part of the Perfect Picnic Challenge, which coincided with the grand re-opening celebrations of eight newly renovated and rebranded Family Fare Supermarkets. From left: Sara Ferris, Center Road Family Fare Supermarket store director; Angela Nichols, MCC student chef and winner of the Perfect Picnic Challenge; and Judy Madison, Boys Town development officer. For the Perfect Picnic Challenge, SpartanNash teamed up with local nonprofit organizations as well as Metropolitan Community College’s Institute for the Culinary Arts to highlight the fresh, local ingredients and cost savings available at the new and improved Family Fare locations. 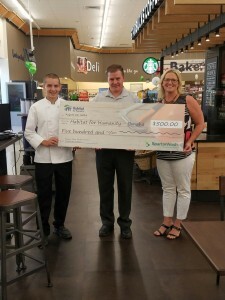 MCC student chefs Angela Nichols and Aaron Fox joined SpartanNash representatives at the Family Fare Supermarket located at 14444 W. Center Road to present the donations to Boys Town and Habitat for Humanity of Omaha. Eight MCC students were challenged to develop a menu for their “perfect picnic” – including a sandwich, salad and beverage – sticking to a budget of $20 to feed a family of four. Store guests could then visit ShopFamilyFare.com to vote on their favorite food-and-drink combinations between July 20 and 27. Each student was paired with a local nonprofit organization, giving them a chance to have $1,000 and $500 donations made to the partner charities in their name. More than 550 votes were cast, with Nichols’ Cajun BBQ picnic chicken, creole mustard vinaigrette smashed potato salad and iced café au lait taking first place. From left: Aaron Fox, MCC student chef and second-place finisher in Perfect Picnic Challenge; Lance Kramer, SpartanNash district manager retail west; and Kathy Roum, senior director of development and marketing for Habitat for Humanity of Omaha. 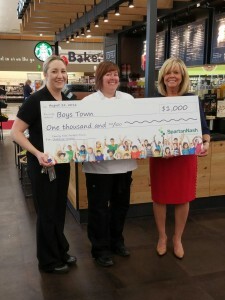 Boys Town – which was founded in 1917 to give at-risk children the family, support and care they need to overcome their circumstances and realize their potential – received a $1,000 grant from SpartanNash and Nichols as a result. Fox’s buttermilk fried chicken with honey mustard sauce, herbed potato salad and peach mango sweet tea claimed second place. His $500 donation from SpartanNash went to Habitat for Humanity of Omaha, which builds simple, decent, affordable homes in partnership with local families. Fox was also the winner of the paneled vote competition held at MCC on July 19. The 17-year-old high school student and aspiring baker was awarded $500 for his picnic-themed creations. SpartanNash owns and operates 14 Family Fare locations in Omaha as well as three Supermercado Nuestra Familia stores. Since Spartan Stores merged with the Nash Finch Company in November of 2013, the newly formed SpartanNash has invested more than $30 million into its retail grocery operations in the greater Omaha market. SpartanNash also operates a large distribution center in Omaha. Boys Town is a beacon of hope for America’s children and families through its life-changing youth care and health care programs across the United States. Now more than 90 years strong, Boys Town’s Continuum of Child and Family Services aims to provide the right services at the right time based on a child’s or family’s needs. In 2015, Boys Town’s integrated continuum of youth care and health care programs impacted more than 500,000 children and families across America. This includes those who received services from Boys Town’s traditional programs as well as those served by the many varied programs which comprise the Boys Town Continuum of Child and Family Services, including In-Home Family Services, health care services provided by Boys Town National Research Hospital and the Boys Town National Hotline. Founded in 1984, Habitat for Humanity of Omaha is a grassroots organization that builds and renovates houses, forges community partnerships and breaks down barriers. We eliminate vacant lots and abandoned homes in the blighted areas of North and South Omaha while improving the overall appearance of our community. Habitat Partner Families are required to complete up to 350 hours of Sweat Equity before purchasing their homes through 25 or 30-year no-interest mortgages. Through Habitat Omaha, more than 450 families have realized the dream of homeownership and are ending the cycle of poverty for their children. In 2016, Habitat Omaha will build or renovate up to 45 homes, demolish 50 condemned houses and repair up to 65 homes through the Habitat’s Home Repair Program. For more information, visit habitatomaha.org.